Time series of images make for interesting viewing – it is a technique that many have used, such as the Chilean-born photographer Camilo José Vergara who recorded changes in particular buildings over 40 years and fellow blogger Bobby Seal who recorded the same view at the same time of day over a year and created a video. On Twitter, the Barnsley Bard, Ian McMillan, creates 140 character poetic ‘images’ of his (very) ‘Early Stroll’ of around 40 minutes, that includes a visit to the paper shop – it is one of the joys of twitter . Early stroll.The sky holds the clouds loosely so they float and slip; in a bus shelter a woman furls and unfurls a huge breeze-lifted shawl. 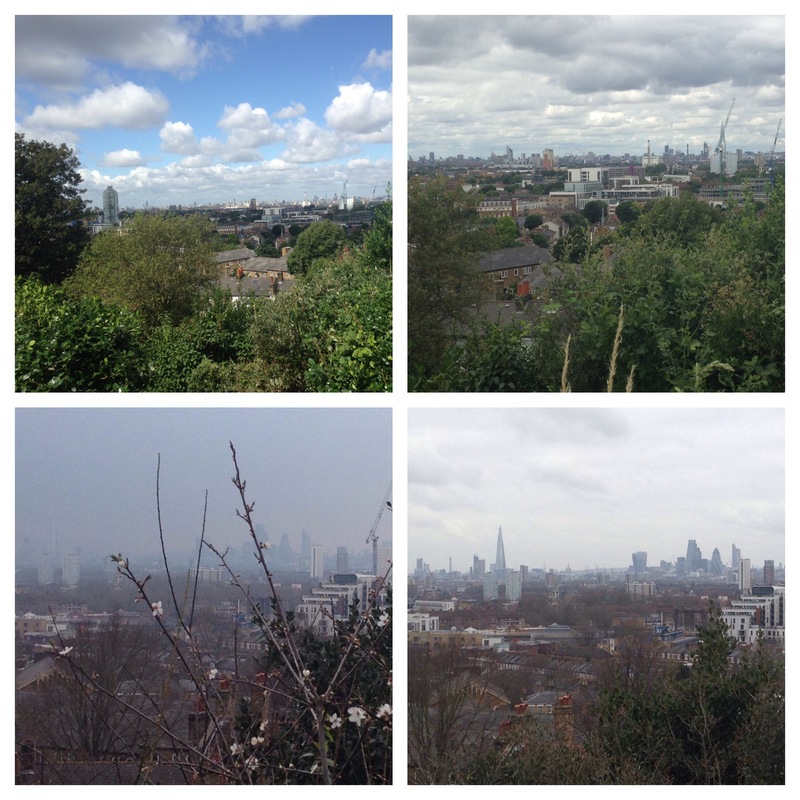 The Point is perhaps my favourite view of London, it was the starting point for my first post on Running Past – there is an uninterrupted vista over the city in an arc from around Battersea in the south west to glimpses of Orbit in the Olympic Park to the north east. Oddly, it isn’t a well-known panorama, often I am the only one admiring; it doesn’t have the impressive Inigo Jones foreground of the view a little further around the escarpment in front of the Observatory which draws in the tourists. It is a place of solitude, despite the proximity of the often pollution laden A2, frequently the only sounds are the birds in the quite dense shrubbery that flanks the viewpoint along with the more distant rumble of the DLR. 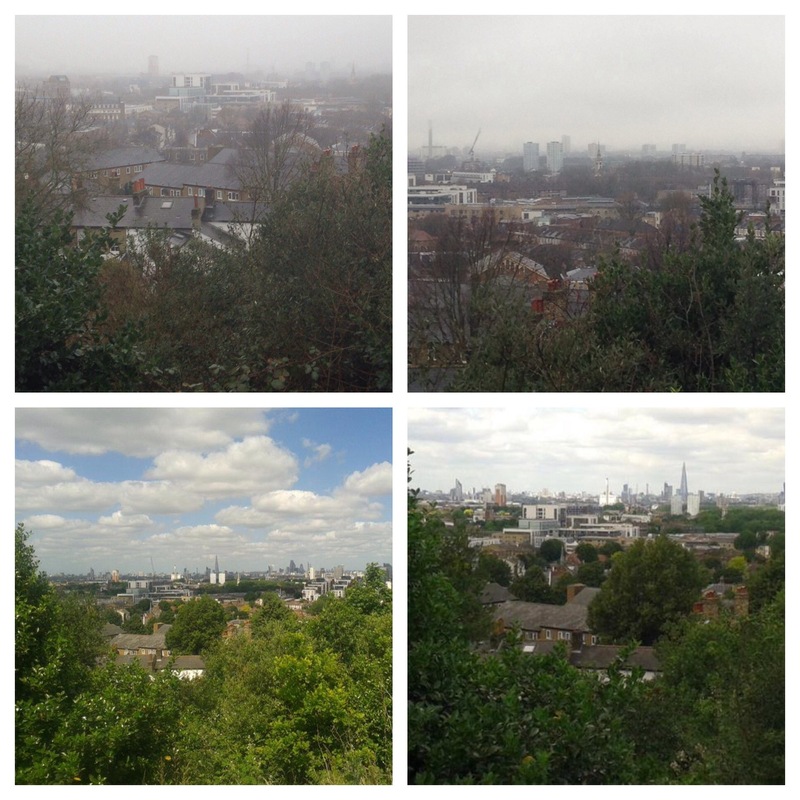 In places, the horizon is truncated by the hilly landmasses of north London – Hampstead Heath and Highgate along with their relatively near neighbour which Alexandra Palace sits atop. All the tall London landmarks are visible – St Pauls, Telecom Tower, the ‘Cheese Grater’, the ‘Walkie-Talkie’, the ‘Shard’, the ‘Eye’, and the tops of the Canary Wharf towers – the number of stories depending on the level of pruning. On a clear day the Wembley arch is visible in a way that the Towers never were – it sometimes glints in the sun – it is about 10 miles away as the crow flies; on a really clear day there are views beyond to what appear to be the tiny undulations of to what must be the Chilterns to the south and Harrow on the Hill to the north of it. I first discovered the view from The Point on a run in the mid-1990s and have been frequently drawn back, although only started taking photographs a couple of years ago. The camera can never pick the level of detail of an eye scanning the horizon – the clarity of the view on a frosty autumn morning or after a summer afternoon downpour are hard to replicate, particularly with a smart phone camera with no optical zoom. Some of the changes would need a much longer time series of photographs to become apparent – most of the larger landmarks of the cities of London and Westminster have appeared in the time that I have been viewing – it is a gradual evolution of the view, almost imperceptible from visit to visit. 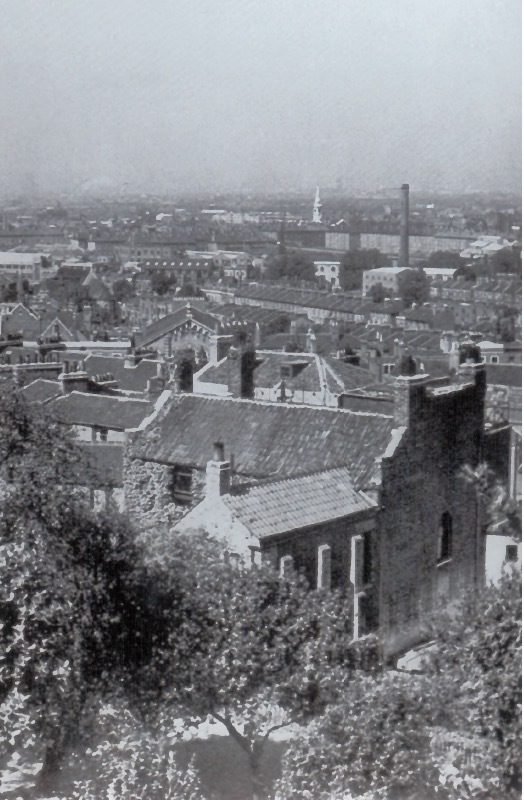 Over longer time periods the view has changed more – I bought a 1940s photograph of the view (taken slightly lower down the hill), while fascinating, its slightly blurry image is almost unrecognisable compared with those 70 years later, with considerable bomb damage around Deptford Creek. Only St Pauls Deptford seems constant – its steeple particularly clear. The middle distance has evolved considerably – the Pepys Estate and other ‘regeneration’ schemes that have brought high specification private housing, but little genuinely affordable social housing, to the riverside and in the process have driven traditional Thames-side activities away from the waterfront. Deptford Creek, the mouth of the Ravensbourne, around a mile away, is much altered – it is no longer visible but now seems lined with glass and steel, including the impressive Laban Centre. 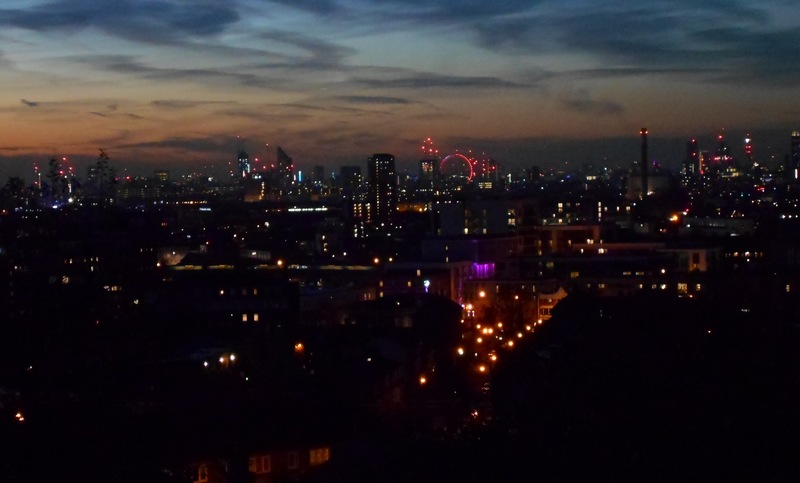 The changes are even greater to the north – when I first ‘discovered’ the view, 1 Canada Square was there but little else on the Isle of Dogs, the Barkantine Estate towers on the east of the ’Island’ were still fairly dominant, they are now dwarfed by everything around them. There are lots of other changes too, which it is easy to forget. Helpfully the viewpoint has a guide to the view provided by the old Greater London Council, which predated many of the now landmark buildings that dominate the skyline, less helpfully , most of the time those in charge of the grounds maintenance have allowed shrubs to block the view it described although an early January pruning has restored the view. Other changes are more obvious – seasons, weather, cloud cover, pollution levels, times of day and foliage growth. The seasons make a surprising difference – the winter sun with its much lower angle casts a very different light to its midsummer counterpart – the former is clearer, brighter and crisper but the contrast is greater. My visits are often on a Sunday morning, more recently I have frequently laced up my running shoes in the afternoon. In the summer, I sometimes eschew the Wednesday evening ‘club run’ for a run nearer home – decisions that are often based around the timing of the sunset or the weather. I only tend to visit in daylight, it is uneven under foot and ill lit at night, although there are exceptions, and rarely when it rains, although where there is a choice I would tend to avoid running in the rain and the phone stays firmly in the pocket. But perhaps that is the key point, I am one of the variables, perhaps the single biggest influence on the series of pictures – it depends on me being there to be captured – it isn’t just the wet days, I may ‘skip’ the loop to The Point if I know the visibility is poor – the clarity of the view towards the spire of Our Ladye Star of the Sea on Crooms Hill from my emergence onto the Heath– is often the bellwether of adjustments to my run. I also decide on the angle of the photograph, the amount of zoom, while my eye is drawn more towards the horizon, the lens is drawn west-north-west towards the City, towards the glimpses of the River. This entry was posted in Greenwich History, Lewisham History, Running and tagged Blackheath, Deptford Creek, River Ravensbourne, St Paul's Deptford, The Point on February 1, 2017 by Paul B.
Today’s run very nearly got off to a very bad start as another runner hurtling down St Margaret’s Passage almost lost his balance on some wet leaves and nearly took me out. Fortunately, he regained it just in time and we both went on our way. The light between the morning’s showers was clear and bright with the Wembley arch and Alexandra Palace both visible from The Point. The church tower and spire of two incarnations of St Margaret and the spire of Our Ladye Star of the Sea almost glowed in the late morning sun. Elsewhere someone had given a bit of tender, loving care to the Cattle Trough at the top of Hyde Vale for the first time in a while. The other highlights of the week’s running were a midweek 11 miles which included Beckenham’s traditional Christmas Lights run past a house covered in lights and Bromley’s High Street, as well as a set of 6 x 800 metre intervals. 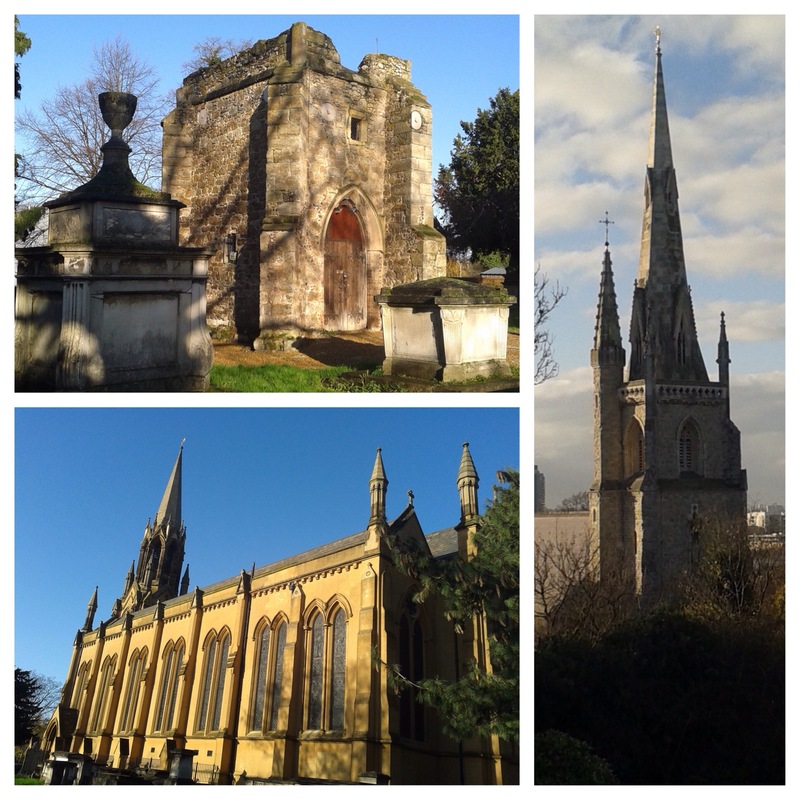 This entry was posted in Running and tagged Blackheath, St Margaret Lee, The Point on December 7, 2014 by Paul B. It seems a while since I have posted anything about running, but that’s because I haven’t done much due to illness. I started getting night fevers in Paris ten days ago and they seem to have taken an age for my body to shake off. I even looked up to see whether I had any of the symptoms of the Ebola Virus, I didn’t, but after careful research narrowed it down to man ‘flu, menopause or an allergic reaction to 1970s John Travolta musicals – probably the first though. So this morning, it felt great to be running again, albeit not very far or fast; it was one of those good to be alive runs – it was sunny, the views from The Point on the edge of Blackheath were almost perfect and there was still a lot of late summer colour in Greenwich Park’s Flower Garden – some Begonias and Rudabekias caught my eye. 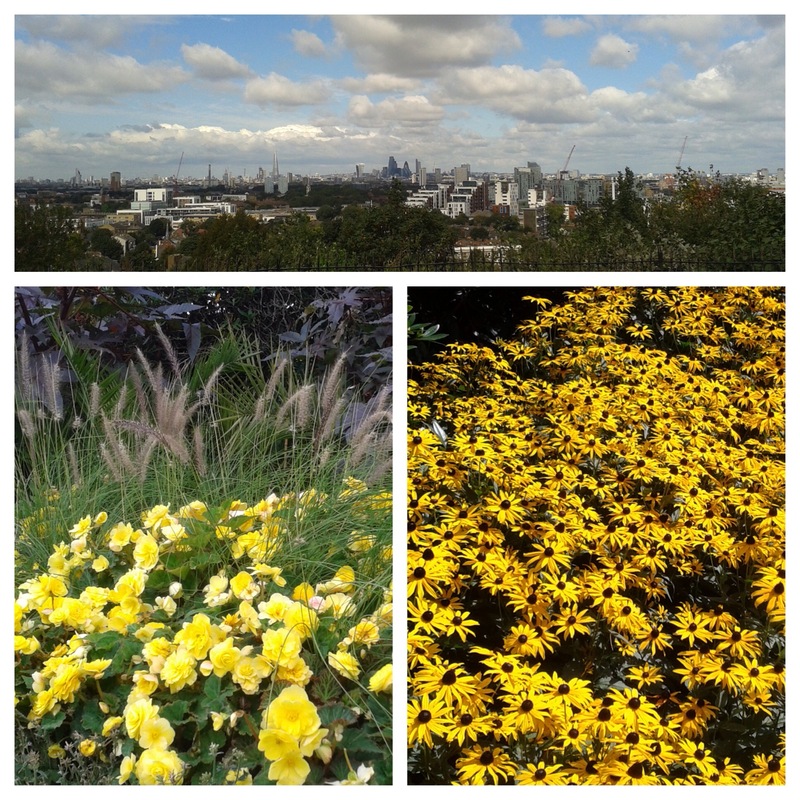 This entry was posted in Running and tagged Greenwich Park, The Point on August 31, 2014 by Paul B. The Point, on the edge of Blackheath,offers a fantastic panoramic view over London; the vista is edged by Battersea Power Station and Orbit, the red sculpture at the Olympic Park, with a horizon made up of Alexandra Palace, Hampstead Heath and, on a really clear day, the north-west suburbs beyond the Wembley arch. 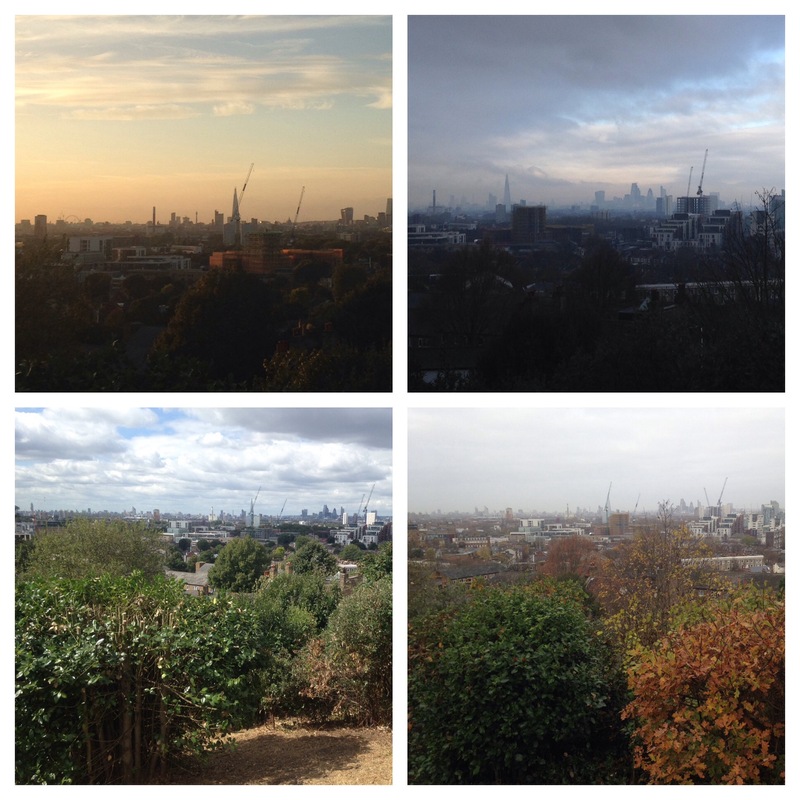 This all frames one of the best views of the cities of London and Westminster. The height and views over the city give a strategic importance to Blackheath as a gathering point for rebels marching on London; this has been well documented in relation to the Peasants’ Revolt in 1381. But much less well known was a gathering of Cornishmen on 16 June 1497. Led by a blacksmith from the Lizard Peninsula, Michael An Gof, and Thomas Flamank, a Bodmin lawyer, the Cornish had taken exception to a u turn on taxation that related to the tin industry by Henry VII to fund the a war against the still separate Scots. 15,000 Cornishmen had marched from the south west and had hoped to get support from Kentish Men; there had been rebellion from that county led by John Cade nearly 50 years before. There was no support forthcoming and the rebels returned initially westwards and after a skirmish outside Guildford headed back towards London ready to march on the City, hemorrhaging numbers as they went. There were probably only 10,000 remaining by the time they camped at The Point, with some archers protecting the strategically important bridge over the Ravensbourne at Deptford a kilometre away. The armies of Henry VII stormed the bridge at dawn the following day, and without any support the bridge was taken and the rebels routed on The Heath over the succeeding few hours – with estimates of between 200 and 2000 dead. Whilst the Henry VII’s General, Lord Daubeney, was captured and then released by the rebels on the Heath; the same was not the case for Michael An Gof, and Thomas Flamank who were hanged, drawn and quartered and their heads displayed on London Bridge, although they were offered a degree of leniency as the drawing and quartering was allowed to happen after their deaths. An Gof’s last words were said to have been that he would have “a name perpetual and a fame permanent and immortal” – sadly his name and cause have been largely forgotten by history. There is little remaining evidence of the Battle of Deptford Bridge, there is a plaque near the entrance to Greenwich Park which was erected on the quincentennary in 1997, and Daubeney Tower – one of the blocks on the Pepys Estate. The actual location of the initial battle is not that certain as the Ravensbourne has been ‘channelised’ at this point and the exact location of the battle could have some distance from the current bridge. 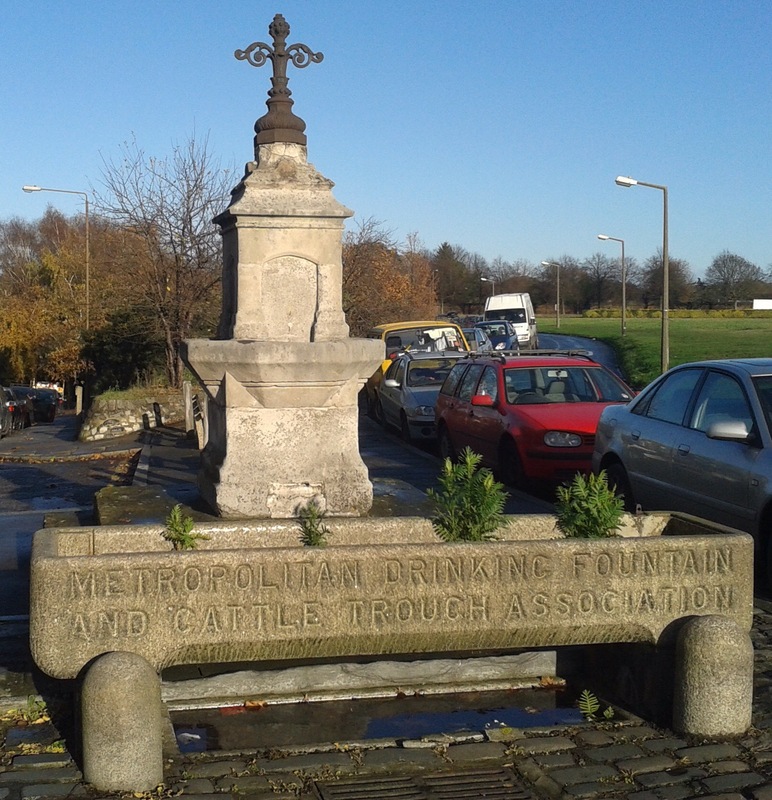 This entry was posted in Blackheath History and tagged Blackheath, Deptford, Deptford Bridge, The Point on January 2, 2014 by Paul B.